Last Sunday, TCY collaborated with Milk & Eggs (@MilkandEggscom) for a day filled with fresh food, cocktails and art. 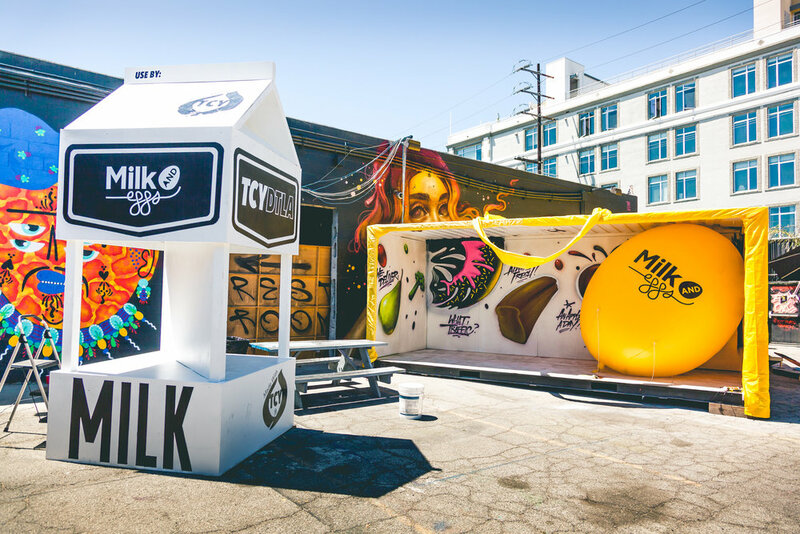 We designed and fabricated a giant milk carton along with a larger than life installation of their reusable grocery tote bag made from a shipping container. @Vyalone demonstrated a live art paint session, illustrating some fresh foods inside of the tote bag installation. A massive wooden "Milk & Eggs" sign was created as a finishing touch for the back drop where the chefs prepped their signature dishes. Featured vendors included @Barlingual, showcasing their mixology skills with fresh tasting summer vibe cocktails aptly named The Artisanal and Farmer's Fiesta. @Domsfoods showed off his specialties with fresh pastas dishes, like the Walnut Basil Pesto, that had you coming back for more. From start to finish, @A_ronthechef with @Cookingonthelam prepared their delicious Butter Lettuce Tacos and Chilled Beef Tataki. Stay up for our next events!